1. Don't take risks - support and protect the feet immediately - by the time clinical signs of laminitis (pain) are seen, changes have already taken place in the laminae. Do everything possible to prevent further or serious damage. 2. Don't wait - take x-rays and carry out realigning trimming at the earliest opportunity. 3. Don't give up - horses can recover from dorsal and palmar rotation of 30+ degrees, distal descent, solar penetration, hoof capsule sloughing.... it is often the misalignment of hoof and bone that causes the pain seen with laminitis, and a realigning trim and correct support can reduce pain immediately. On p 351 of Care and Rehabilitation of the Equine Foot Pete Ramey says “at the first signs of laminitis, restore P3 to a more natural ground plane” (i.e a 3-5 degree palmar angle), “relieve pressure on the walls and pad the sole with foam rubber – vertical sinking and destructive pressure to the solar corium can be prevented”. It should be simple. And yet the majority of horses that we've seen die from laminitis have died because of a failure to support or realign the feet. Continue to protect and support the feet throughout the rehabilitation. 1. Ensure feet are always correctly trimmed and balanced. Long before any signs of laminitis are seen, ensure feet are always correctly trimmed and balanced - if you do this, there's every chance you'll never need the rest of the information on this page! Whether shod or barefoot, the hoof should be trimmed as frequently as necessary to ensure the hoof capsule always grows tightly around P3 with strong laminar connections. 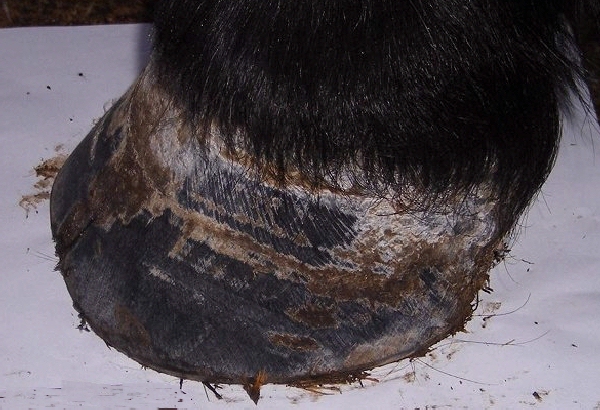 "The proper trim is one where the hoof capsule correctly conforms to the bones within it." "Too many horses fail to recover from laminitis due to incorrect trimming." ECHoof - Yahoo group linked to the Equine Cushing's & Insulin Resistance Group - post hoof photos and x-rays & receive information about the rehabilitation of laminitic or foundered feet. barefoothorsecare - Yahoo group specializing in barefoot hooves. Sorrel - click on the photo to see Sorrel's successful hoof rehab and IR management. 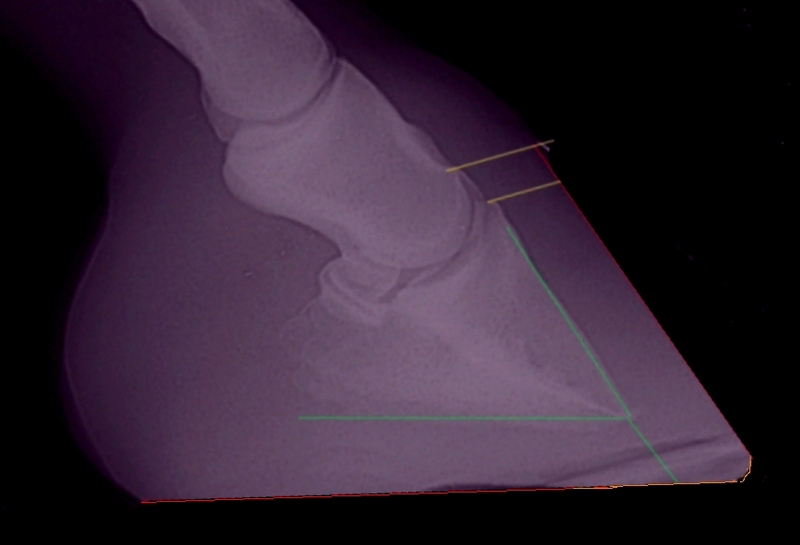 X-rays are essential to know what is really going on inside the hoof after laminitis. Abnormal changes may not be seen initially in a first-time case of laminitis, but x-rays at the earliest opportunity are useful to give a baseline against which any later changes can be measured. The photos on the left were taken 9 days before the x-ray on the right. Other than a crack at the toe, the lateral photo of the hoof didn't look too bad - heel a bit high, perhaps. The sole photo gave a bit more information - heels forward of the back of the frog indicating the heel was too high, a deep black void where the white line should have been, indicating disconnected walls, and measuring the collateral groove depths indicated a shallow depth at the apex of the frog and a large difference in depth between the apex and the back of the frog, suggesting P3 rotation. However no one had anticipated the 20' dorsal rotation and 19' palmar rotation shown on the x-ray. 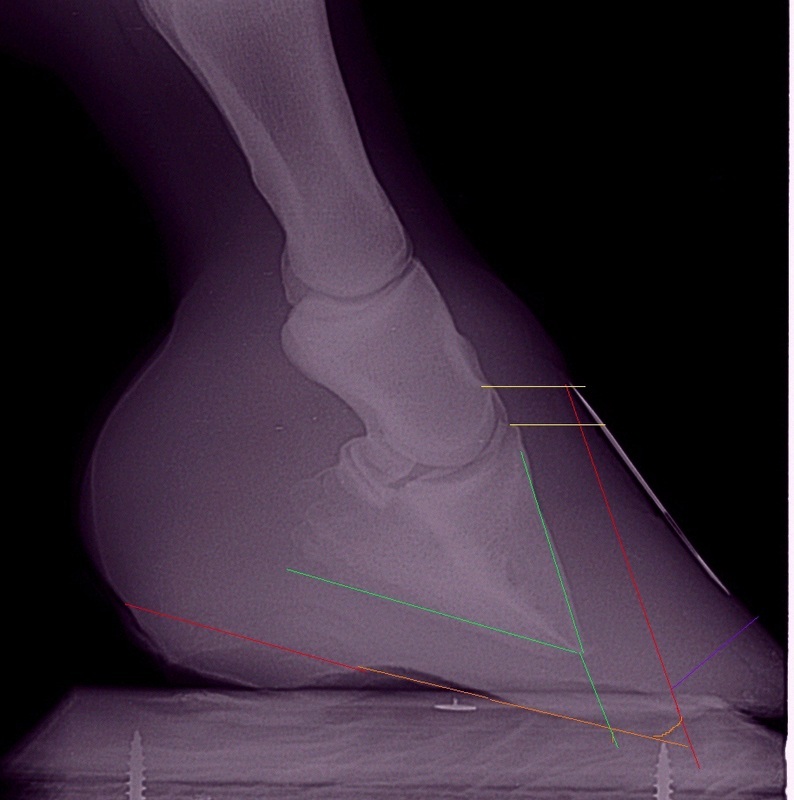 As well as rotation, x-rays can also show distal descent (sinking) of P3 (yellow lines), sole depth, bone loss, haemorrhage/abscesses, and can also indicate other problems such as arthritis not associated with laminitis but which may affect return to soundness/prognosis. 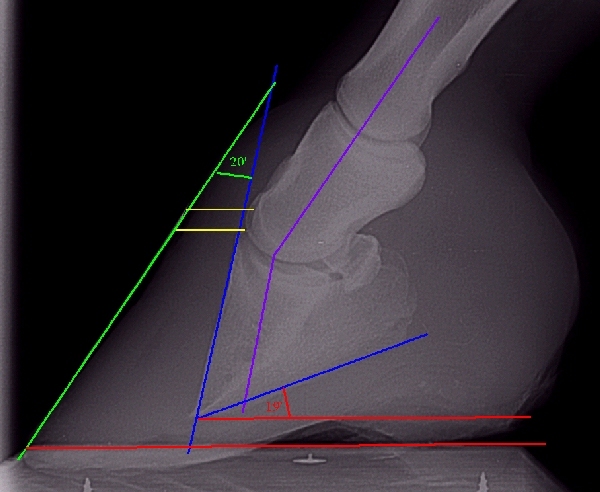 The angle of rotation can be calculated either as the angle where a line drawn along the dorsal hoof wall (green) and the dorsal aspect of P3 (blue) meet - the x-ray (left) has an angle of rotation of approx. 20' (marked in yellow) OR by subtracting the angle that the dorsal hoof wall forms with the ground (approx. 55' marked in green) from the angle that a line projected down from the dorsal aspect of P3 forms with the ground (approx. 75' marked in blue) - 75' - 55' = 20'. The palmar angle (front feet) or plantar angle (hind feet) is the angle between the bottom of P3 (the solar margin) and the ground. The x-ray (left) has a palmar angle of approx. 20'. A palmar/plantar angle of around 3 - 8 degrees at rest is generally considered healthy (depending on several factors and individual to each horse), to allow for P3 to sink to a more ground parallel position during movement. Following rotation, returning P3 to a "normal" palmar/plantar angle is an essential part of the rehabilitation process, usually brought about by reducing the height of the heels. The heels should never be trimmed lower than the live sole plane, and to avoid tendon or ligament damage, the heels should not be lowered by more than 1cm in one trim. When extensive laminar separation has occurred, a radiolucent gasline can often be seen on a lateromedial radiograph. The foot must be fully supported to prevent further mechanical failure of the laminae and further movement of P3. Radiograph taken 7 weeks after sudden acute laminitis with rotation in all 4 feet. The right hind (shown) had the worst rotation, and has a significant gasline extending almost from the coronet to the ground. (Note the radiograph beam was not perpendicular to the hoof - both wings of P3 can clearly be seen). Radiograph taken 4 months after previous radiograph, and nearly 6 months after the acute laminitis - the gasline is growing out. (NB the heels need to be significantly lowered on this foot!). The bone has moved - so move it back! When rotation and/or sinking have occurred following laminitis, there's no question that either the hoof capsule and/or P3 are no longer where they should be! And yet many professionals seem happy to leave them in the wrong place, some even using devices that move them further out of alignment, for example by raising the heels. If a human suffers a displacement fracture it's accepted that soft tissue injuries, nerve damage and impaired circulation can result, and the bone is realigned to its anatomical position at the earliest opportunity and immobilized/supported so that healing can take place - this usually happens within hours of the injury occurring. 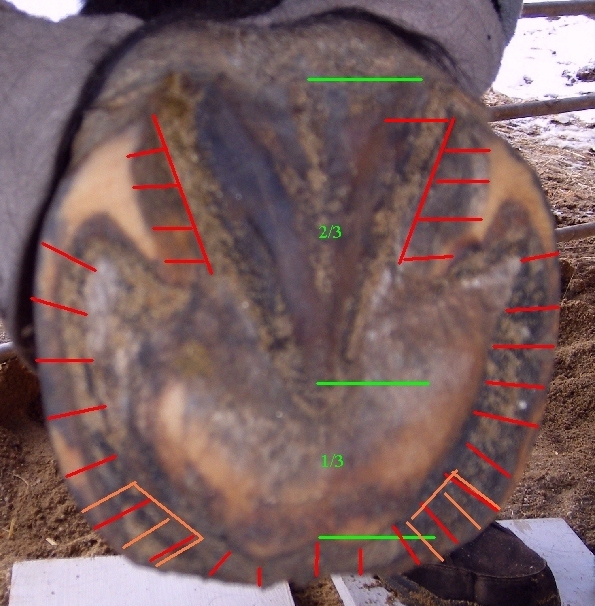 So surely it follows that when P3 has rotated or sunk, the hoof should be trimmed to realign the hoof capsule to P3 as quickly as possible, thereby returning P3 to its correct anatomical position, because while P3 and the hoof capsule are not correctly aligned, there is a risk of soft tissue injury, impaired circulation (and nerve damage? ), particularly at the coronary band and solar corium, which could lead to permanent damage, bone loss and sepsis. Correctly realigning the hoof to P3 also allows healing to take place and a tight new hoof capsule to grow down from the coronary band. Furthermore, while P3 is incorrectly aligned, the joint alignment of the whole leg and ultimately the whole skeleton will be affected - for this reason horses that have had rotation often benefit from manual therapy (physiotherapy, Equine Body Work, massage..). 3. Black out the areas to trim/grow out to see how the new hoof will look. 4. 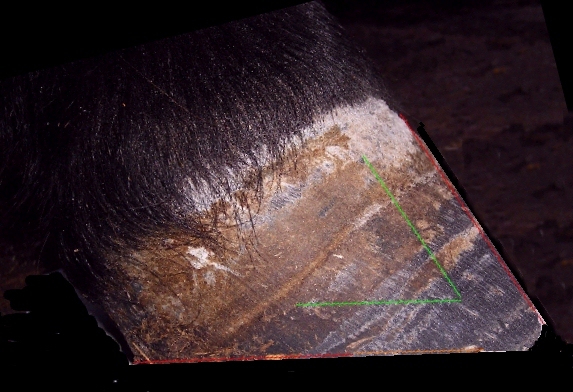 Apply the trim mark-up to a hoof photo. On this hoof with long-term chronic laminitis the toe has been brought back but there is still heel and wall to remove. The back of the heel (red line) is still forward of the back of the frog (green line). retain some wall height at approx. 2 and 10 o'clock (orange) to protect P3 where the sole was thin and encourage the sole to thicken. As a guide, 2/3 of the foot should be behind the apex of the frog and 1/3 in front (green). This trim removed most of the excess heel and wall, greatly improving the pony's comfort. 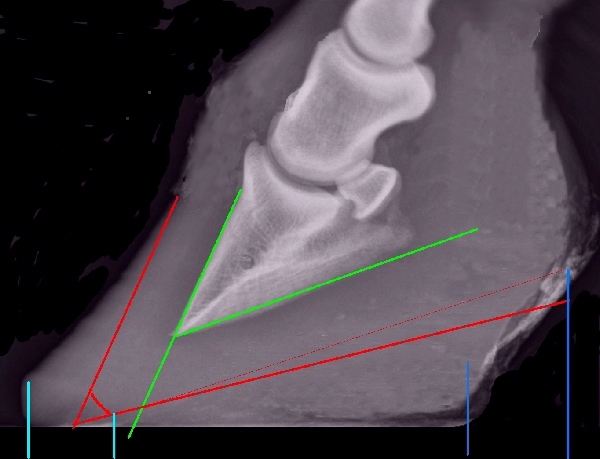 The back of the heel (red line) is now pretty much in line with the back of the frog (green line), increasing the weight-bearing surface at the back of the foot. (The sole at the toe should not have been touched with the rasp!). The rehabilitating hoof will usually require extra protection - hoof boots with thick pads generally work well and allow for frequent realigning trims. 1. A foot with long-term chronic rotation, high heels and a long toe. The frog will not be weight-bearing with heels this high. Breakover is currently at the left-hand turquoise line, and palmar/heel support ends at the left-hand blue line. The required realigning trim is marked in red. The dotted red line is approximately parallel to the solar surface of P3, the solid red line just below it will give a palmar angle of approximately 5'. 2. After carrying out the realigning trim, breakover will be at the right-hand turquoise line, significantly further back under the horse and just in front of a line projected down the dorsal surface of P3, reducing forces on the laminae. The weight-bearing surface at the back of the foot will be increased significantly - palmar/heel support will be at the right-hand blue line, and the frog should now be weight-bearing. To the horse, this must be the equivalent of taking off a high-heeled stiletto and putting on a well-designed trainer! Monique Craig of The Epona Institute says that the "support length", that is the length of the foot that supports the horse's weight, should be located towards the back of the foot. Heel angle and heel height are important - heels that are too low may indicate weak supporting tissues, but heels that are too high prevent the frog making contact with the ground and sharing weight bearing. There should only be a short distance between the heels and the bulbs - see how the distance between heel and bulbs shortens considerably between x-rays 1 and 2 above when the heel is lowered. According to Pete Ramey, "nothing else matters more than a good sole". Adequate sole depth becomes even more important following rotation and/or sinking of P3. Rasping - farriers used to trimming for shoes frequently rasp sole in front of the apex of the frog - never rasp this sole unless the collateral groove depth is adequate. Diet - inadequate or unbalanced minerals and excess sugar may lead to reduced sole growth. Flared or disconnected walls cannot protect the sole - laminitic horses rarely have good sole at the toe. 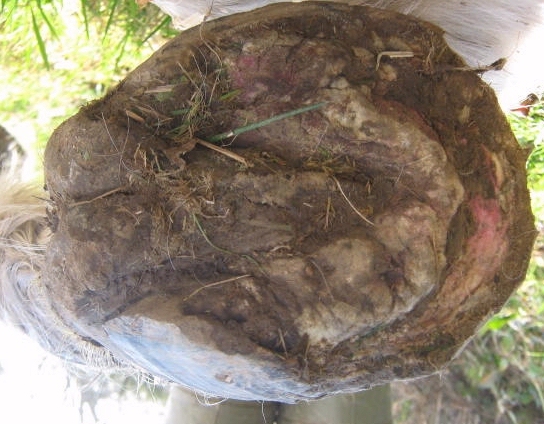 The reason for the laminitis/wall disconnection must be removed to enable healthy sole to grow. Poor circulation - vascular damage from chronic laminitis can damage sole producing cells. So how do you know when the sole is the correct thickness? Measure the collateral groove depth (the grooves either side of the frog). 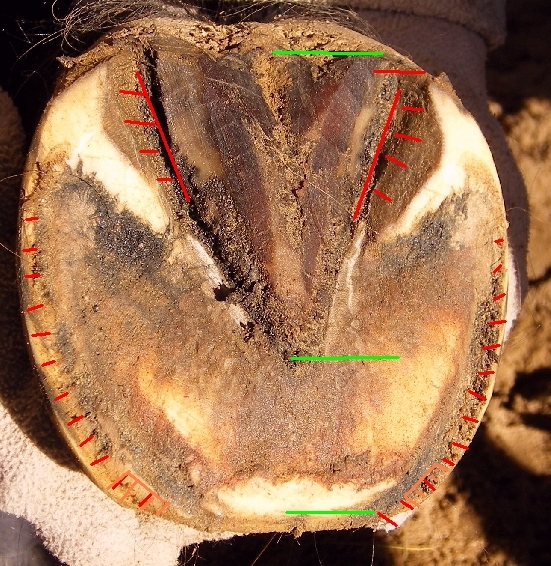 Pete Ramey - Understanding the horse's sole: "If you cut the grooves deeper on a cadaver hoof, you’ll find that it is about ½ inch to the sensitive corium; whether the rest of the sole is too thick or too thin. This means that if a horse has too much sole, the collateral grooves will be too deep. If there is not enough sole thickness the collateral grooves will be too shallow." When the sole is the correct thickness, the collateral grooves will measure around 1 - 2 cm at the apex of the frog, and 1.5 - 3 cm at the deepest point near the bars towards the back of the frog. If the collateral groove depth at the apex of the frog is less than 1 cm, the sole is too thin and should be protected, e.g. 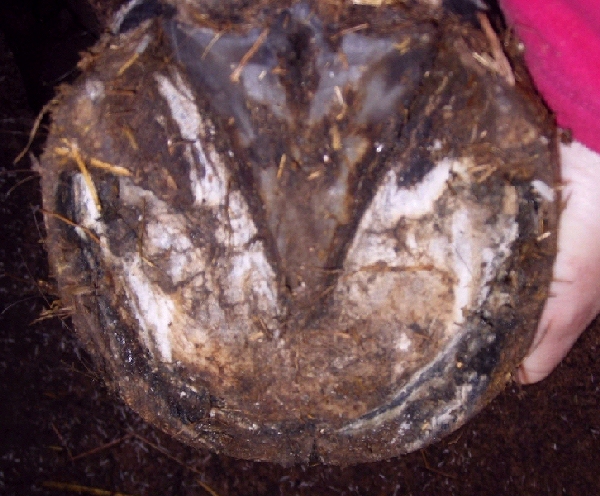 with boots and pads, until the sole has thickened (see Pete Ramey - Understanding the horse's sole for how to do this). 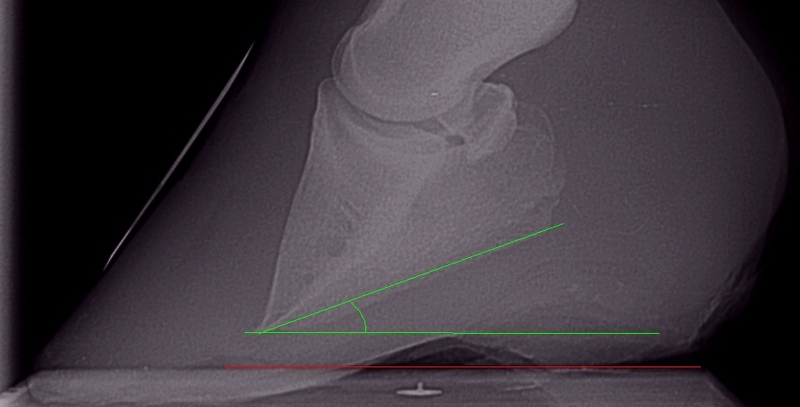 If the collateral groove depth at the apex of the frog is 2.5 cm or more, there is probably excess sole to be removed. The rasp should never be used within 1.5 cm of the collateral groove – it is never correct to trim live sole. 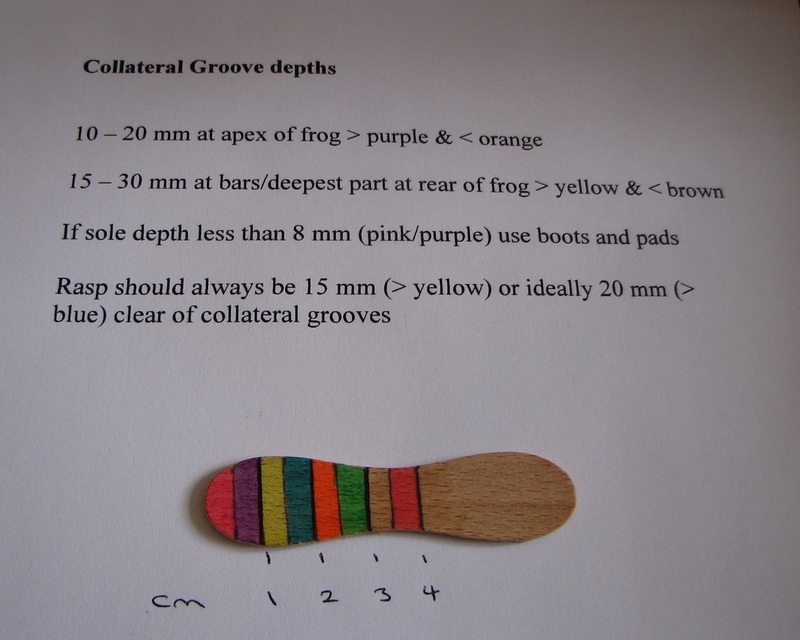 See Using the Tool - Collateral Groove & Sole for photos showing how to measure the collateral grooves. Lay something flat, e.g. a rasp, across the sole of the hoof from side to side, first at the apex of the frog, then towards the back of the frog near the bars. In each position, measure the depth from the bottom of the collateral groove to the sole at the white line - i.e. to the bottom of the rasp but subtracting any wall height above the sole. The Precision Hoof Pick (left) is a great tool for accurately measuring collateral groove depth, or make your own measure using e.g. a lolly stick divided into 0.5 cm colour-coded bands (right). There's a good example of obvious collateral groove imbalance and the consequent damage on the No Frog, No Hoof, No Horse Facebook site (post dated 16 July 2011). Horses recovering from founder (rotation/distal descent) will nearly always need or be helped by some form of foot protection. Hoof boots with pads are inexpensive, can be left on 24/7 but taken off every day to check the feet, and allow frequent trims. Feet can get sweaty in boots. Using a medicated powder in the boots (Gold Bond, Lanacane, athletes foot powder, No Thrush for feet with thrush), changing pads frequently and/or removing the boots for a few hours each day while the horse is on dry soft supportive bedding (sawdust, sand, pea gravel) can help. If you only buy one book about laminitis, make it Pete Ramey's Care and Rehabilitation of the Equine Foot (see chapter summary). Expensive, yes, owing to the hundreds of colour photos and illustrations, but oh so worth it - and in fact probably no more expensive than one set of remedial shoes or one set of x-rays. Although Chapter 28 is entitled "Laminitis (An overview - see also chapters 1-31)", the whole book is directly or indirectly related to laminitis - understanding the equine foot, the role of diet and the environment, how to trim the foot for optimum balance and health, and how to reverse P3 rotation and distal descent - all the information necessary to rehabilitate the equine foot following laminitis and other common foot pathologies, plus how to keep the foot and horse healthy after rehabilitation, and how to prevent these problems in the first place. There are no gimmicks, no fancy shoes or treatments - just information based on recent research, many years of experience and a good helping of common sense. In our opinion, essential reading for any vet, foot care professional or owner dealing with a laminitic horse - or any horse, for that matter. Please note the information relating to trimming is presented simply as case studies, it is not advice to be followed and does not represent trimming guidelines. Every case of laminitis is unique, and what works for one horse may not work for another. Always consult/use a qualified professional. What does laminitis do to the feet? "All cases of endocrinopathic laminitis, regardless of their clinical duration, showed chronic pathology in the abaxial region of the hoof wall that in all but 1 horse was correlated with divergent hoof rings."